We are not a party hostel but guests could have pre quality drinks here at our minimal bar before jumping into a party. 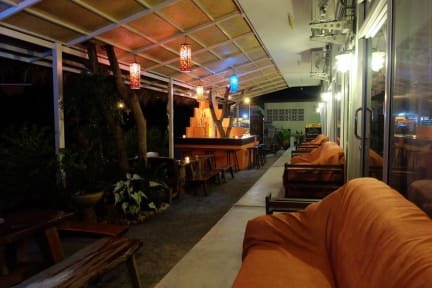 Smile Hostel is a good accommodation choice for the trip in Koh Phangan, conveniently located in Baantai , It is a-5 minute drive from Thongsala Pier and a 15-minute drive from Haad Rin, where the full moon party is held. It features mixed air condition dormitory rooms with free Wi-Fi and hot shower. Rooms are always clean and warm welcome by family hostel. We provide a common space to sit and enjoy socializing and relaxing front of the room. The hostel comes with a bar, tour desk, ticket service and locker. Free car parking and easy to get taxi service to full moon party, and we are only 10 minutes drive from all major Island parties i.e. half-moon festival, black moon party and jungle experience etc. 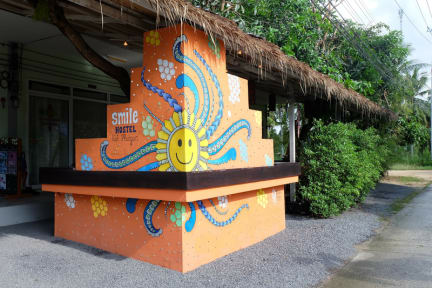 Smile Hostel Koh Phangan is a few step away from ATM machines, convenience stores and Bantai beach. Restaurants with Thai and western cuisines are nearby. 1. Check in from 9:00am to 10:00pm. 2. Check out until 11:00am. 3. We accept cash (THB) and Paypal. 4. Cancellation policy: At least 3 day advance notice before the arrival date is required for cancellation free of charge. (1) Children cannot accommodate at the hostel. (2) The minimum age to stay at the hostel is 18 years old. 6. The reception is open from 9:00am to 10:00pm. 7. No smoke, food or drink inside the rooms. 8. Pets are not allowed in the hostel. The owner has two friendly dogs, if you feel uncomfortable with dog, you might be better staying in other hostel. 9. Towel, blanket are provided for free, and no room key deposit but if lost, you will be charged 500THB each. 10. Body paint colour stain on bed sheet, pillow case or blanket, you will be charged 800THB each. 11. Broken bed, you will be charged 8,000THB. 12. Only paying guests are permitted to stay in dorms, person from outside fines 1,000THB. 13. Guest is allowed one bed, do not change or use the empty bed, fines 1,000THB. Really nice place to stay! The owner Boy is an amazing guy. He and he’s wife helped us to see nice places in Koh Phangan. Thanks Boy! I LOVED IT! The owner (Boy) and his family make this place feel like home. They are caring, warm-hearted and make your stay on Koh Phangan one to remember! Great facilities, very clean and a good atmosphere. The owner is a legend! I had an amazing time staying at the smile hostel, the host was great and helped with everything! I can recommend staying here if you're going to full moon or any other party on Koh Pangan! Very kind people! The beds are a little hard though. Rond oud en nieuw in dit hostel gezeten maar veeeeel teveel betaald voor wat je krijgt. Veel herrie van de andere gasten waar maar weinig aan wordt gedaan door de staf. Verder ben je voor alle dingen op het eiland aangewezen op scooters, auto's of taxi's, niets is op loopafstand. Wel bijzondere snelle WiFi voor Thaise begrippen.